Hi all, we’ve had some great weather over the last month along with a few real scorcher days that have seen the local swimming holes a popular place to cool off. We managed quite a few trips outside with a run of gentle winds and have been treated to some excellent Rainbow Beach deep sea fishing. Red Emperor, snapper, pearl perch, Moses perch, parrot, scarlet sea perch, sweetlip, cod and wrass have been the majority of catches. Cobia and tuna have been stretching a few arms along with some quality size Mahi Mahi. 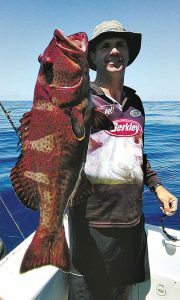 Our last trip out saw one of our regulars Evan Horton with a 5kg coral trout. The straits have been producing some quality jacks for those putting time and effort into chasing these predators along with the odd decent barramundi. Along the beaches has been a little hard with weed still hanging about, a few reports of tailor and trevally caught between the weed patches along with some decent flathead. I hope all had a great and safe holiday, till next month, cheers, Mat. Gala dinner will bring kids from the bush to the beach!